Democrat presidential nominee Hillary Clinton held an impromptu press gaggle Monday that was interrupted when the former Secretary of State was overcome by a coughing fit. It has still been 275 days since Clinton has held an actual press conference. It is important to note the difference between a gaggle and a press conference. A press conference is a scheduled event where the press is given the opportunity to prepare and ask questions. 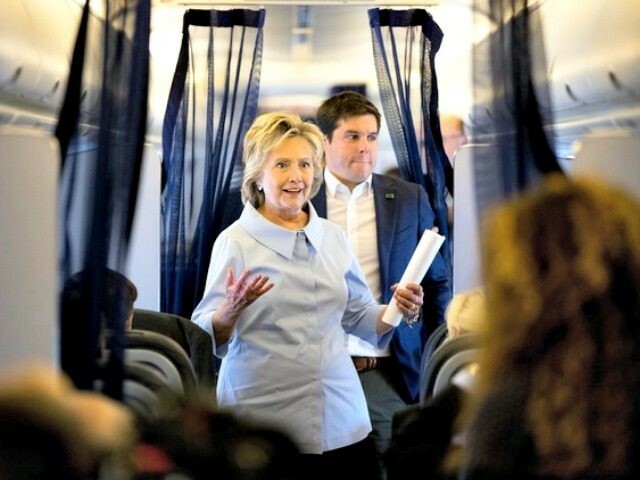 Clinton’s impromptu gaggle was not announced in advance and was limited to just the press traveling with her on her campaign airplane. Clinton fielded just seven questions in her attempt to quell the “hiding Hillary” speculation before excusing herself during a coughing fit. She returned later to answer five more questions. At a press conference Clinton would likely be asked by serious journalists about her use of a private email server and handling of classified material during her tenure as Secretary of State, lingering questions about her mental and physical health, and other serious questions pertaining to her ability to serve as President of the United States. Breitbart News will continue to report on the number of days since “hiding Hillary” held a press conference until she holds an actual press conference.